Recently, Barbara and I received a wonderful comment from a reader telling us how our blog had helped her go gluten free. This reminded me of why we originally started The Gluten Free Homestead. In 2004, four members of our family went gluten-free (GF) after we found out that we have a sensitivity to gluten and wheat. As many of you know, making the transition to GF can be traumatic. Giving up pasta and pizza is not easy, especially for teens. To make the transition easier for us, Barbara set out to not just recreate our old meals into GF knock-offs but to create new exciting GF recipes that would make us forget our old standard American diet (SAD). As a homeschool mom of four children, she also knew what it meant to be busy. So her GF recipes were designed to be made quickly and easily. After years of meticulously crafting incredibly delicious meals, we suggested that she ought to share them with the entire GF community. In 2013, she began to do so, and the Gluten Free Homestead was born. Our mission was to show others journeying on the GF lifestyle that it didn’t have to be hard, uninspiring or something to fear. GF food could, in fact, be better than the old non-GF food. And better yet, a tasty GF meal could be whipped up for the entire family often in a matter of minutes. However, since the start of the Gluten Free Homestead, our food philosophy has matured and evolved beyond GF. Yes, all are recipes are still GF, but we believe eating healthy means so much more than simply ditching the gluten. In order to explain our philosophy, allow me to take you on our health journey. It’s a long one so fasten your seatbelts. You’re in for a bumpy ride. When he was a child, our son Michael was a hard gainer. He always measured underweight for his age and height. We had all kinds of tests done, but nothing ever turned up positive. Every MD and dietician we visited just recommended that he consume more calories. At seven years old, he was already eating almost as much as his teen-aged siblings, but it wasn’t working. Nothing we tried helped him gain enough weight to get to normal on the height and weight charts. We eventually assumed he was just taking after me. As a child, I also was severely underweight. I ate normally, as much as all the other kids around. I also consumed weight-gain drinks and drank at least a half of a gallon of milk a day. It didn’t work. At 17 years old, I was almost 6′ tall and weighed only 127 pounds. Let me just say skinny insults hurt just as much as other body shaming slurs. Nonetheless, we just thought Michael was following in my footsteps. However, we eventually began to notice a decrease in his energy levels. At one point, he had difficulty making it from one side of a football field to the other. He was also becoming sullen and moody. We didn’t know what to do, and the mainstream medical community didn’t have any answers. On Thanksgiving Day 2003, my cousin related to me that his father (no blood relation) was diagnosed with celiac disease (CD). I was kind of embarrassed that I didn’t know what it was. After all, I did have a degree in podiatric medicine. Since many systemic diseases and their sequelae can manifest in the foot and ankle (e.g. rheumatoid arthritis, heart disease, diabetes, cancer, gout, neuropathies etc. ), our training in internal medicine is pretty thorough. But CD was a condition I’d never heard of. However, as my cousin listed the symptoms, my interest piqued. Many, except for diarrhea, seemed to apply to Michael and me. The following day I checked the internet for what information there was on CD (there wasn’t a whole lot in 2003), and again I found that we had many of the symptoms of CD (except for diarrhea). These symptoms included fatigue, abdominal bloating (both of us), mouth ulcers, headaches, high liver enzymes, arthritis, joint pain and abdominal pain (me). And, of course, our low weight as children. I should also mention that my dad and my grandfather had a similar history to mine. They also were underweight until their twenties, and they also suffered from fatigue problems. My grandfather died from lymphoma in his 50s. Was it possible that we had CD? At this point, I should also mention that in 1986, I had come down with chronic fatigue syndrome (CFS). At 30 years old, I was a pretty active person. I maintained a podiatry practice, ran every day, and lifted weights. However, one day in 1986, I woke up and had difficulty getting out of bed. My legs felt like they weighed a 1,000 pounds. I could stand for no more than a few minutes, and then I had to sit down. Throughout the day, it didn’t get better. Curiously, extreme fatigue was the only symptom I had. After about three days, I was able to go back to work, but I still couldn’t stand for more than fifteen minutes at a time. All told, I had lost about 70% of my previous energy level. After a few months, it didn’t resolve. Some days my symptoms were better, but then a day or two later they were back in full force. There is no standard diagnosis for CFS. You basically have to meet a standardized set of criteria. I easily met the criteria. Since the fatigue came on me quite suddenly, my doctors theorized I had contracted some unidentified virus. Because of the CFS, I was forced to give up my podiatry practice. In 2003, I was still functioning at only 50% of my normal energy level. Some days I could function adequately for a few hours, and others I was totally wiped out. I wasn’t dramatically improving, and my doctors had no answer. I now suspect that I probably needed months of complete rest. But with a family to support that wasn’t going to happen. Nonetheless, after that Thanksgiving day, I began to suspect that gluten could be one of the reasons why I wasn’t healing properly from CFS. A few days after Thanksgiving 2003, Michael and I went GF. Okay, in retrospect I know that we should have been tested first. But in my zeal to try something, we decided to adopt a GF diet. I figured we could always do a gluten challenge later and get tested. After about two weeks, the change in Michael’s energy level was significant. It was about 50% better. Within a month, it was almost 100%. It was as if he was a completely changed person. He had excellent energy and a new positive attitude. Now, what was I supposed to do? Should I have put him back on gluten in order to get tested and perhaps risk a relapse? No, I didn’t have the heart to do that. My job as a parent is to get him to adulthood as healthy as possible. And he was significantly healthier off gluten than on it. If he wanted to get tested later on, then it would be his choice. He also gradually began to put on weight. Today, at 20 years old, he is still slim at 5’7″, 120 pounds. But he can bench press 135#, deadlift 205#, squat 175# and press 80#. He is now in the process of upping his caloric intake because he wants to get stronger. In February 2004, my oldest son, John, and my daughter, Nicole, wanted to be tested for CD. Neither one suffered from diarrhea, but John often had bad gas and bloating after eating, and Nicole had very bad eczema as a child (as did I). Peter had absolutely no problems with gluten so we held off on his test (he later tested negative). John and Nicole’s blood tests showed they didn’t have CD. Their tissue transglutaminase (tTG) was normal, thus indicating no intestinal damage from CD. However, they did have two abnormal results. Their gliadin IgG and wheat IgG numbers were extremely high. I didn’t have much knowledge about celiac tests, but it seemed to me that if an antibody result was abnormal something was going on. When I questioned the pediatrician on the significance of high gliadin antibodies, he had no answer. At the time, most practitioners didn’t have a lot of experience interpreting the AGA IgG test. Also, I don’t believe most labs today even test for AGA IgG. It’s been replaced with the newer deamidated gliadin antibodies, IgA or IgG test. Today some researchers believe that a high result for the older AGA IgG test is suggestive of a condition called non-celiac wheat sensitivity (NCWS) or non-celiac gluten sensitivity. See here, here, and here. In this condition, an exposure to wheat can trigger a systemic immune reaction with accompanying intestinal cell damage (leaky gut). See this recent study by researchers at Columbia University. Symptoms caused by NCWS can include GI discomfort (IBS-like), skin reactions, fatigue, and other neurological issues. While our children probably didn’t have classic CD damage to their intestinal villi, they still could have been experiencing an immune reaction to wheat. Because of the ambiguous results and in light of Michael’s dramatic recovery, John and Nicole decided to go GF. One of the confirming factors of NCWS is feeling well once gluten is removed from the diet. John said he immediately felt better and no longer had stomach issues after eating wheat. He says that when he cheated and ate gluten while in college, he would be sick and fatigued for days. He’s now 28 and still GF. Nicole is still GF too. Her eczema is much improved. In 2006, everyone was tested for the celiac DQ gene. Everyone tested positive except Barbara and Peter. Since gluten sensitivities are often familial and because of his fantastic recovery off of gluten Mike is GF. Because of the children’s results and my history, I’m also GF. Barbara is GF because she prefers to eat that way. Peter, while he may sneak a hard roll every now and then, is always GF at home. Today, however, even if I didn’t have a medical reason to be GF, I still would go that route. I’ll get to that later. Our food philosophy, however, doesn’t stop at GF. After seven years of being on a GF diet, I had some improvement with my health but not a significant amount. I attribute part of this to consuming gluten for 47 years and suffering from CFS. My digestion and elimination were a lot better. However, my energy levels had only improved about 10 – 20%. I still had significant fatigue and was only functioning at about 50% of my pre-CFS energy levels. I also continued to have arthritic changes and pain in my finger joints, continuous muscle pain, sinus problems, headaches, and high liver enzymes. Any kind of strenuous exercise was out of the question. During a routine check-up, I mentioned to my doctor that I was having moments of increased heart rate in the evenings, and it felt like my blood pressure was high. I was right. My pressure was high, and he suggested that I wear a halter monitor to record my heart rate through a 24 hour period. The halter monitor results were confusing. It revealed that my heart rate was elevated at night but during the early morning hours it fell to only 43 beats per minute. The cardiologist’s report stated that it was possible that I had some kind of problem with my autonomic nervous system. See here. My doctor gave me a prescription for BP meds and said I could see a neurologist if I wanted to be tested for dysautonomia. See also here. I had had enough of doctors so I declined and just took the meds. While I knew a GF diet was a necessity and it had given me some improvement, it was not the spectacular improvement that Michael had. I was beginning to think I would have to live the rest of my life feeling miserable every day. In 2007, Barbara and I started a program of daily walking. I started slowly but within a few months, I was able to do a brisk 1.75 miles daily walk without suffering additional post exercise fatigue. In fact, I gained another 10-15% recovery in my fatigue levels. I was now at about 65% recovery. I stayed this way for the next 6 years except for the fact that I had gained about 23 pounds after I went GF. During college, I actually gained about 40 pounds, and since then I had kept my weight at about 170 pounds. Now I had ballooned up to 193 pounds. For me, that was a lot of weight. I should mention that I did see a naturopath. He gave me a lot of supplements but never made a suggestion of a change in diet. However, a further change in diet was exactly what I needed. In September of 2013, a friend of mine who recently had heart surgery mentioned that he had bought a Vitamix blender and was juicing vegetables (technically, the Vitamix blends). I had heard about juicing before and had tried it in the past, but it was such a nuisance cleaning the machine that I gave it up after a couple of weeks. This time was different. I read all I could about juicing. One extremely important point juicing advocates and others stress is that many chronic diseases are a result of chronic low-grade inflammation. In order to heal chronic inflammation, the body must be deprived of things that drive inflammation and supplied with the necessary nutrients to fight it. This made a lot of sense. In my case, chronic inflammation was evident (arthritic changes, high liver enzymes, fatigue). The question was where was it coming from? The Columbia study I cited earlier showed that NCWS can cause a leaky gut. Also, CFS is thought to have an inflammatory component. It was becoming clear to me that in order to get well I needed a diet that would help heal the chronic inflammation and not create new inflammation. By eliminating gluten, I had eliminated one possible inflammatory source. Would juicing be the nutrient source I needed? An important thing to understand about a GF diet is that it’s not necessarily an anti-inflammatory diet. It will stop the autoimmune inflammatory reaction taking place in the celiac’s gut, but it may not stop generalized chronic inflammation. And it may not be enough to enable the body to heal from the damage done by years of gluten consumption. A GF diet may not even be sufficient to heal the gut of some celiacs. See here. Also, many GF diets simply replace non-GF meals with a GF replica. For example, instead of wheat pasta or bread, a GF version will contain either rice or corn or some combination of GF grain. The problem is that these products are usually highly processed and contain high amounts of sugar. Thus, they can be highly pro-inflammatory. So a GF diet might help those with gluten problems but at the same time not help them if they are suffering from chronic inflammation. 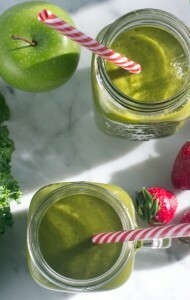 For about 3 months, I religiously consumed at least 32 ounces of a green smoothie daily. They usually consisted of some combination of organic kale, carrot, avocado, Romaine lettuce, apple, celery, collards, chard or spinach. Consequently, I received another big boost in my energy. I was now at about 75%. This meant that while some days were still intolerable, more were becoming tolerable. There were no days however when I felt absolutely great. Since the smoothies had given me such a boost of energy in a short period of time, I knew there was something to the concept of a healing diet. If juicing large amounts of organic vegetables was making me feel better, then doing even more of that should obviously make me feel even better, right? The logic seemed inescapable. So I dramatically increased my vegetable consumption. I also started to cut way down on my meat consumption. This was part of that theory that says animal products can cause your blood to become too acidic thus creating a toxic environment. Consequently, I lost about 25 pounds over the next 3 months. However, I also began to relapse. Not badly, but I felt my energy levels regressing. In January 2013, I began seeing a specialist in CFS and auto-immune disorders. He basically confirmed everything I had already learned. I had chronic inflammation and one liver enzyme was still slightly elevated. He also suspected a viral component. Surprisingly, my BP had normalized. However, he did find that my cortisol levels were abnormal at night. That suggested that I had adrenal fatigue. He recommended that I eat more protein, and he gave me a bunch of supplements including one for adrenal fatigue. He also suggested I rest more and destress. About the same time, another friend mentioned that I should take a look at the dietary suggestions in Mark Sisson’s Primal Blueprint. He pointed out that the diet is heavy on vegetables and at the same time encourages the consumption of “good” meat and fish. Sisson’s way of eating is part of what he calls the Primal Blueprint. It’s his version of a paleo-type diet. Let me first say that I don’t ascribe to the theory that the diet is valid because it mimics the way our paleolithic or “caveman” ancestors ate. Since I am a creationist, I don’t believe there is a cogent evolutionary premise for the diet. However, that also doesn’t preclude the diet from being healthy and having good scientific evidence to support it. Here are some of the basics of the paleo diet. Some proponents are more strict than others on some items. An important concept concerning the paleo diet is that it’s not really a diet. There is no need to count calories. It’s a way of eating. Paleo diets contain a protein intake of about 10-35 % of your calorie intake. See here and here. This is higher than that found in the SAD. If you are a moderately active adult, you would need about 0.5 – 0.8 grams of protein per pound of lean mass/per day on average to maintain your “structure”. Fresh organic vegetables and fresh fruits are the main source of carbohydrates and will make up about 10-45 % of your daily calories. This is much lower than what is recommended in the SAD which is generally about 45 – 65% of calorie intake. Without eating bread and potatoes, it would be hard to consume more than a 100 grams of carbs a day. If we take the average percentages of protein and carbs recommended in a paleo diet, we would see that fats make up at least 50% of the diet. Omega-6 polyunsaturated fats should be limited and healthful monounsaturated and Omega-3 fats should be increased. Also, there have been numerous studies that show saturated fats have no adverse effects on health. See here. As you can see, the paleo diet contains nutrient-dense foods. This means it includes foods that contain high amounts of minerals, vitamins, and antioxidants with relatively few calories. It also eliminates pro-inflammatory products such as cereal grains, sugar, high-fructose corn syrup, refined carbs, processed packaged foods, vegetable oils, and processed meat. See here. Most paleo diet proponents advocate an 85-15% rule which allows you to consume three non-paleo meals per week. Of course, this should not include cereal grains. Over the course of about two weeks, I studied the scientific literature and found that the diet was well supported by the data. This was no fad diet. I began the paleo diet and made sure to include sufficient amounts of fermented vegetables and 24hr probiotic yogurt. Since I was one of those individuals who took way too many antibiotics from the time I was a child, I probably severely disrupted my gut microbiome. See here. Within two months on the paleo diet, I picked up that extra 15% in energy level I coveted. My BP remained normal, my weight stabilized at 172 pounds, I stopped snoring, my sleep improved, and I was feeling the best I had in over 28 years. I also made some important lifestyle choices. I began to optimize my sleep and reduce my stress levels. By the end of 2013, I was about 90% healed. I felt so good that I was even ready to start strength training. Twenty-eight years of a sedentary lifestyle had done a lot of damage to my musculature. I wanted to reverse that. Today, I’m still about 90% healed. However, some days I’m at 99%. I praise God for that. I’ve been barbell training for 2 1/2 years without interruption. I’m currently almost as strong as I was at 30 years old. Because I’m now doing squats and deadlifts, I may be stronger. Here are some of my current 1RM’s: bench press, 200#; deadlift, 290#; squat, 175#; press, 90#. I weigh 180 lbs. I still have to be careful with my energy levels. My adrenals still need care and fatigue will creep up on me from time to time. I carefully track my macronutrients, and I do take some supplements. I’ll talk about them another time. The most important element in my healing process has been juicing and the GF paleo-type diet. I’m feeling better than I ever thought I would and doing things I never thought I would ever do again at my age. Barbara and I turned 60 this year. Many might think that’s a signal to start thinking about retirement or old age stuff. However, we’re not interested in growing older. Instead, we’re focused on getting healthier and stronger and trying to help others do the same. Even though the clock is ticking for everyone that doesn’t mean you have to look forward to a life of decreasing health that ends in disability or frailness. Through this blog, we will continue to bring you healthy and tasty GF and often paleo recipes that will make your life so much more enjoyable. And we will explore current trends (often those which go against the mainstream) in health, diet, fitness, and anti-aging that can empower you to have a healthy, happy, fit, balanced, active lifestyle. Now if I could only pick up that last 10% of energy. Thank you for this post. I have a couple of friends who have Celiac disease, and this really helps me understand what they are going through, and their daily struggles. This is so incredibly informative!! Pinning and sharing. I have so many friends with celiacs disease. Wow this is pretty much exactly what I went though with Lupus. Almost 10 years getting worse before I learned about Leaky Gut! So simple yet no doctor talks about it. I did GAPS diet. It is the same idea of eliminating inflammation & avoids the same nasty modern foods. It is free to do & it is fast. I was bed ridden many days, always sick& miserable. Within 3 weeks of GAPS diet I felt healthier than ever before in my life. I know how it feels to thank God for this information. It gives you your life back & now we can share with many others who have lost hope. A big issue is now so many children are GAPS & have immune issues from leaky gut , antibiotics, etc the vaccines are not safe for these kids. Forgive me for the delay in responding. I’m so glad you are feeling better. I whole heartedly agree, a good diet is essential to good health and for good healing. I’m now experimenting with a ketogenic diet to see if I can cure that last bit of inflammation I still seem to have. I’ll let you know how it turns out.